As part of the plan, she wrote down the names of 62 people she could reach out to build a client pipeline. Before she lept she had four months of work lined up, helping ease the fear of leaving a corporate salary behind. She leveraged her existing knowledge and connections to build a new way forward. In my own coaching practice, I often see people waiting for more knowledge, more money, more time or more ‘comfort’ of some kind, before they leap. But it just doesn’t work that way. Because leaping is inherently UNcomfortable. Chances are, you already have enough of what you need in order to leap. You just need to give yourself permission to be uncomfortable and ask, not know all the answers before you start, and back yourself to find a way. What wouldn’t you be doing? Who might be your 62 people who could help get you there? What are the smallest next steps you do you need to take to start making this more of a reality? HEADS UP! 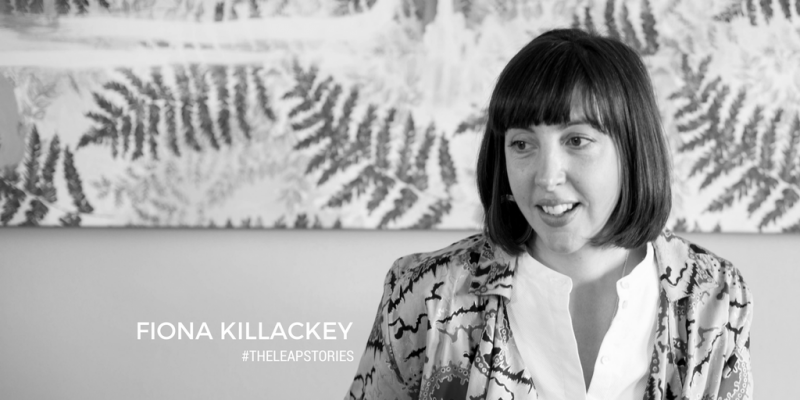 Fiona is collaborating with a fellow leap taker Natasha Morgan to host a Marketing for Small Business Workshop in Daylesford on Sunday, April 15. You don’t want to miss Fiona’s marketing brilliance gained while working for Amazon, Audible and Mimco over 15 years, all delivered in autumnal Daylesford with a local produce lunch! Tickets here. When I was about six I wanted to become a nun. I’d watched A Nun’s Story with Audrey Hepburn and convinced myself I could travel and help sick people (and fall in love eventually and quit the sisterhood!). But mainly I wanted to write and tell stories. I would make up stories all the time and write them down in my little notebook. I’d also put on accents and perform for my family. When I was about 8 years old, I created “the toilet times” a newspaper all about what had been happening in the Killackey family that week which was hand-written complete with comic strips. I’m Irish, so I guess writing and sharing stories is just part of my DNA. I did a Bachelor of Arts as I had no idea what I wanted to do after school and majored in Sociology with grand plans of becoming a professor in that field. I then went overseas at 21 and worked in magazines, then came back and completed a postgrad diploma in Journalism. I worked in magazine editing for years then realised I needed to know more about editing and publishing so did a postgrad diploma in that at RMIT and took on an editorial role in book publishing. I’ve always loved studying people and society and I think 15+ years of being a published writer (mainly features and in-depth interviews) plus a decade working in marketing and looking at the psychology of purchase, has allowed this love affair with people and their makeup to grow. What has been your most scary/courageous leap you’ve ever made? Quitting a really well-paid executive marketing job to go out on my own as a consultant. I had worked for myself previously as a content editor, journalist and copywriter, but that was before I got married. This time I had a son, husband and a new mortgage to consider. 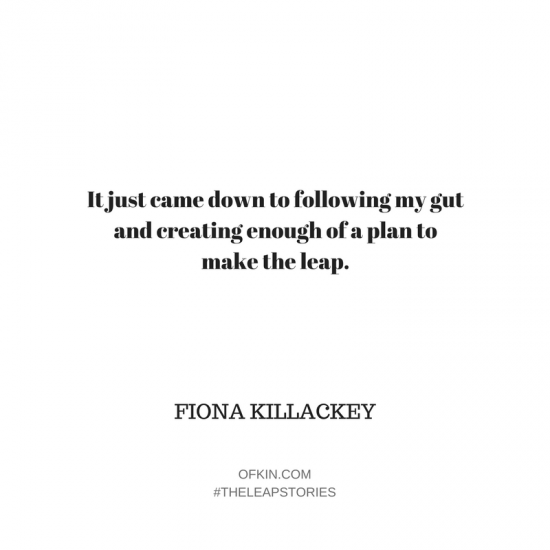 It just came down to following my gut and creating enough of a plan to make the leap. I was Head of Marketing for a large Australian retailer, managing a team of 16 across PR, Marketing, Digital/Online and Content/Creative. My husband has always been a massive influence on me. He is super calm and has never equated what he does to earn money (Art Director / Creative Lead) with his identity as a son, father, husband, brother and friend. He has always encouraged me to follow my heart rather than any financial gain. My parents influenced me massively too. Both of them worked their asses off to get me and my three siblings to good schools and then to support us through university. They knew no one in Australia when they arrived with four kids in the 1980s but somehow made it work. My mum was the world’s biggest feminist. She worked as a psychiatric nurse, then went back to Uni in her late 40s to become a social worker, working with parents of terminally ill children. Despite such a gruelling job, she was always there for us at home and was my go-to for any career (and life) advice. I’m lucky to have a group of women in business that I can go to for advice and encouragement. They inspire me with their ambition and love for what they do. I think working at Amazon taught me so much about bringing your best to work and taking the initiative to self-educate, I was surrounded by people who wanted to excel, who wanted to experiment and who were not afraid of failure. Other than that, I love podcasts and books and YouTube and am constantly learning from anyone and everyone. I genuinely believe every person can teach you something…if you’re open to learning. 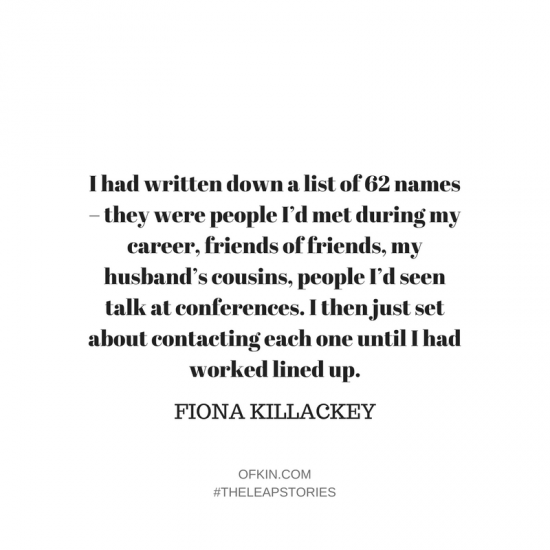 I had written down a list of 62 names – they were people I’d met during my career, friends of friends, my husband’s cousins, people I’d seen talk at conferences. I then just set about contacting each one until I had worked lined up. This took a few months. Once I had 4 months work lined up, I quit my full-time job. I had a rough idea of what I needed to earn and I wanted to make sure my “leap” wouldn’t put stress or pressure on my husband. I had two really clear moments. The first was when I was working during a public holiday. We were staying with family near the beach and I looked out the window to see my husband and family laughing outside, playing and talking while I was inside an empty house, glued to my laptop and working so hard on things that, really, didn’t matter. I shut the laptop down and went outside and it felt so incredible to make that decision and switch off. The second was a workshop a friend invited me to. The woman running it asked us to write down our day, one year from now. I just felt compelled to write about a day working for myself, from home and having time to be with my husband and son. When the workshop ended, she asked us how we felt. I said “I just want to be in this life” pointing to my notes. She said, “Well, you can be. How you live is up to you”. It was the next week I started working on my exit plan and building my own business. I feel like the universe had been bashing me over the head for some time, urging me to see there was a life outside of 24/7 work but I’d ignore it. I’d get sick constantly, I’d be argumentative with family, I’d stress out about small things, I wasn’t eating well (if at all) and was dreading Monday mornings. 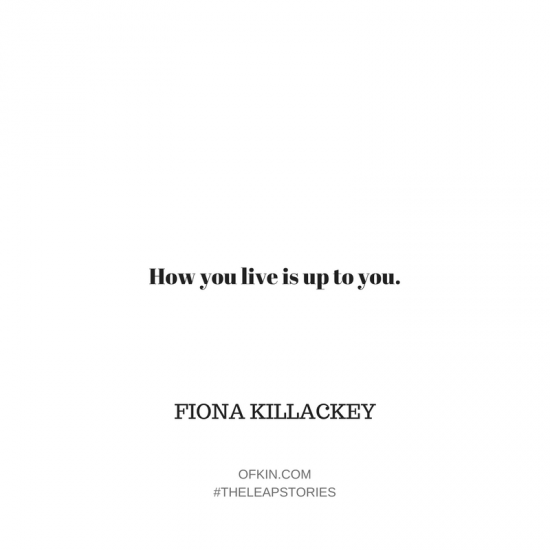 I could see this life I had wasn’t working for me, but it took me really realising I had the power to change it, to actually leap. When I decided, fully, to go out on my own I thought about the worse thing that could happen. It would be to have to go back to working for someone else in-house, full-time. For me, that wasn’t that bad. I kind of played the mantra of “If this doesn’t work out, so what. Go get another job, Fiona” over and over. I have a strong work ethic and the thought of having to go and get a job at a café or a supermarket (while not ideal) doesn’t phase me, so the worse case scenario wasn’t that bad. What was really scary, was imaging my life as it was for the next ten years then looking back with regret in my 40s and wishing I’d jumped sooner. I set up enough work for four months and looked at all the revenue streams I could bank on (workshops, 1:1 consulting, writing work etc.). I also looked at what I needed to earn (the minimum for the year) and pulled back on some of the more expensive parts of my life, like online shopping or going out for dinners with friends. My husband was on board and we also tried to save as much as we could before I lept. I was asked once to audition for the social column in The Age newspaper. It meant going to a film premiere and asking people I didn’t know a bunch of questions. I wasn’t allowed to say I was from The Age, so essentially it was me striking up conversation with some celebrities and writing about the experience. I’m an introvert and back then (2007) I was petrified of doing this. I locked myself in the toilet and almost threw it all in. I knew the column could lead to other things though (i.e. quitting my full-time book editing role) so I forced myself to do it. When I was 20 I bought a one-way ticket to London, not knowing a single person in that city. I found someone online to live with (who seemed nice enough over the phone) and got myself a job. I was young, naïve and totally believed I could take over London with a completed Arts degree! I hadn’t learned my lesson and in 2009 did this all over again, with my husband in tow. I’ve often just contacted an editor from a publication and asked if I can write for them. This has allowed me to write for so many brilliant publications like Monocle, Cool Hunting, Refinery29, SOMA, The Age, Russh, The Design Files, Broadsheet and more. I think a lot of people never ask, when they should. 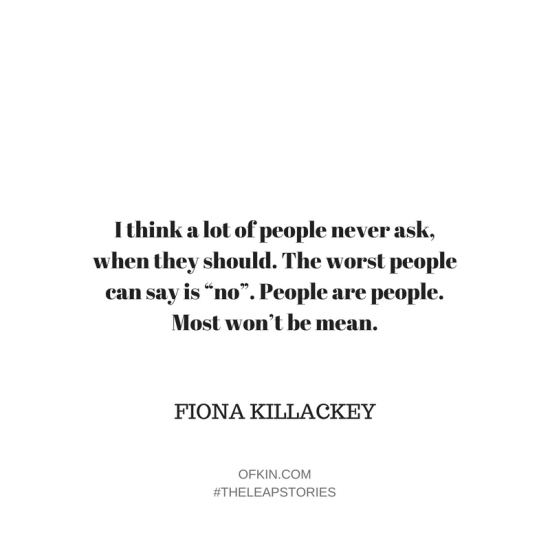 The worst people can say is “no”. People are people. Most won’t be mean. When I first went to London, I thought I’d get a job at a magazine despite having zilch experience. I interned at two publications and realized how much more knowledge and networks I’d need to get a (paid) foot in the door. I ended up taking a receptionist/PA job at an advertising agency where I learned all about copywriting. The change in direction opened up my mind to other ways to get your writing out there and was my first insight into marketing well. When we went to London in 2009, I had been working for myself (in Melbourne) and thought getting a job in another country would be easy. It was the start of the GFC and everyone wanted someone with UK experience. No one had heard of half the brands I’d worked for and Australia seemed such a tiny town in comparison to the US, UK and parts of Europe. We went from winter in Australia to winter in the UK and it got me down. But I persisted and persisted, going to interviews all over the country and applying for anything that resembled what I wanted to do. I just felt it was a numbers game. Eventually, someone would say yes. I’m fearful of regret. I think about this a lot. I’ve had a lot of death in my family in the last 18 months and it’s made me consider what I want to leave behind. How do I want people to feel about me and my impact on them? How do I want to contribute to the world? How can I help people in my own life and also in the wider community? I used to be lured by money and titles in my career but you can’t take anything with you and what people talk about at funerals is not what you did for work, but how you made them feel. What sort of friend, mother, sister, wife were you? How did you shape the community for the better? The fear of regretting parts of my life – of not having helped somehow make the world a little better, even for one person or not having done what I really want to (travel, write a book, be with family etc.) – has had a significant effect on what I do, how many hours I work, how I play with my son, how I prioritise things, the friendships I aim to foster and how I show love. 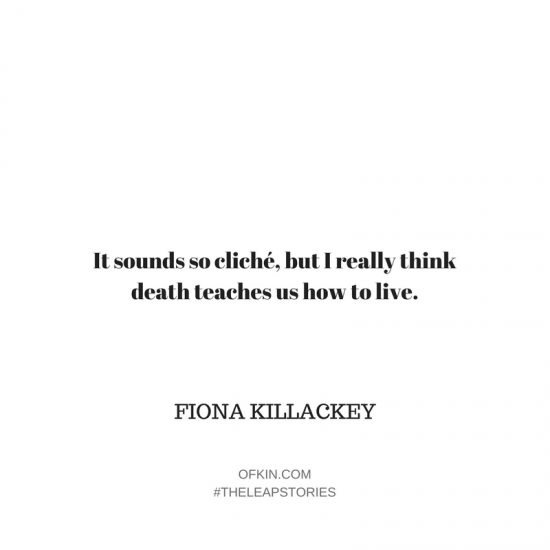 It sounds so cliché, but I really think death teaches us how to live. 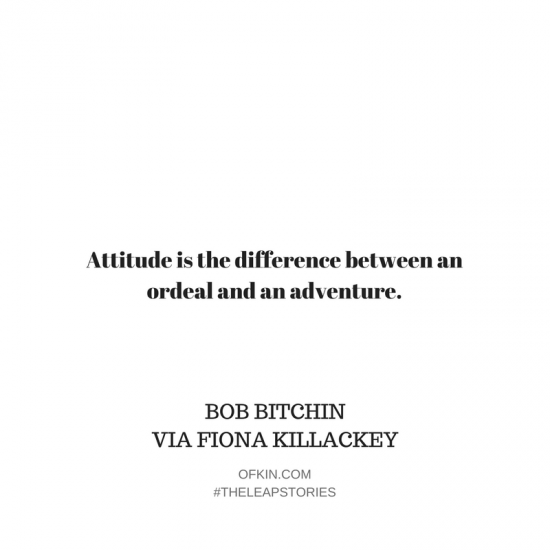 How would you rate your level of happiness about making your leap?1 being sad, 10 being rad. 10! Even on the nights I work until 1am for a client deadline or when clients ask for something way out of scope and I have to have an awkward conversation about fees, I still LOVE what I do. I get to work on creative projects and problem solve, alongside some of the most wonderful people I’ve ever met and for businesses I really respect and admire. 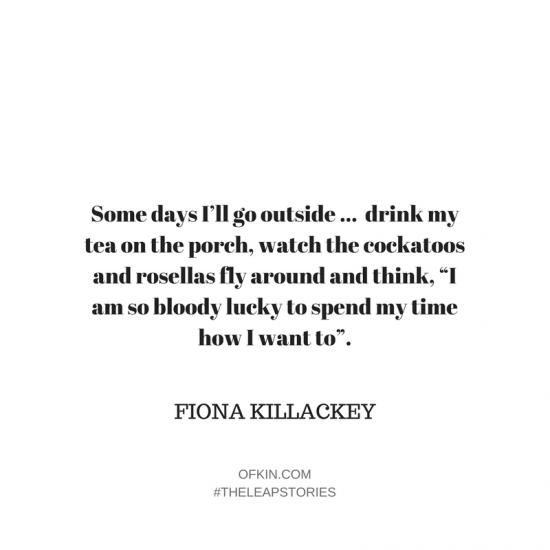 Some days I’ll go outside our little log cabin (where I mainly work from), drink my tea on the porch, watch the cockatoos and rosellas fly around and think, “I am so bloody lucky to spend my time how I want to”. Having the freedom to plan and own your time. I spend more time with my son and we go on little outings all the time or play games at home (like finding treasure in the garden). I’m more present for my husband and I can make time to go for a walk or eat right or return phone calls. I have time to think about projects, read and research things and I’m not rushing from meeting to meeting then trying to cram everything else in after hours. I can spend time with my elderly dad or work late for a few nights then take time off and I don’t have to clear it with anyone. I choose whom I work with and I can set the schedule. I LOVE when a client starts viewing their business in a new, more energised light after our work together. More and more people are starting small businesses and I love being able to help people realise how much power they have to grow them. Confidence can be a challenging factor. When you have a job in-house and you have a title like Head of Marketing, there’s an expectation from those you work with that you went through a process of education and experience to get where you are. People often know your work history and you have time to display your skills. When you work as a consultant often you’re coming into a company with no one — apart from who has directly hired you — knowing anything about you. This means you have to feel strong in yourself and in your skills to bring that confidence with you. That’s been something I’ve had to learn again and again since going out on my own. One of the best ways I’ve learned to get through this is to ask clients for feedback. Often I’ll convince myself I didn’t do a stellar job, and then the client comes back with the most wonderful, long email all about how I’ve helped them and given them new insight and it feels awesome. Or, you hear someone during a workshop say “Ah! I’m learning so much” and it makes you feel like, ok, I do know what I’m talking about, I’m actually helping people. I’d like to put on some events and write a book. Watch this space! My late mum. She moved from a little seaside town near Dublin to New York in the 1960s to work in a hospital amidst a lot of racism and sexist attitudes. She worked across New York and San Francisco standing up for what she thought was right – equal treatment of patients regardless of colour, sexual orientation or religion. She made another leap marrying my dad (they were engaged after one date) and coming to Australia on her own, with four kids under 6. 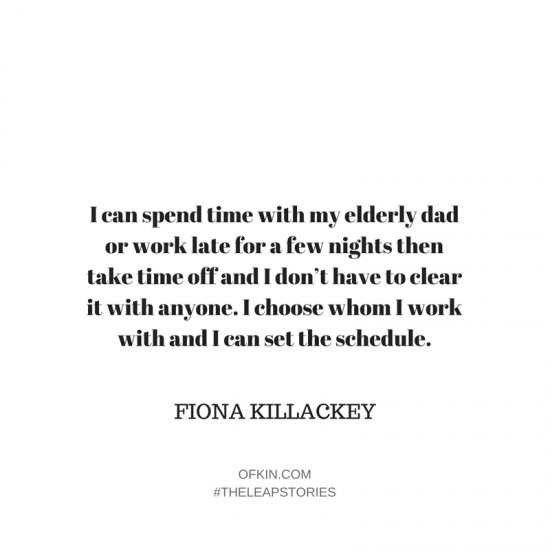 In her late 40s she made the leap to go back to Uni, despite working nights and raising four children all at school. Mum made leap, after leap, after leap. She never boasted about any, but instilled in my siblings and I the belief that anything is possible. You just need to go out and get it. If not now, then when? Life is short. Imagine it’s one year from now. Would you be happy to be in the exact situation you’re in now? Listen to your instinct and take a chance. There are so many people that can help you. 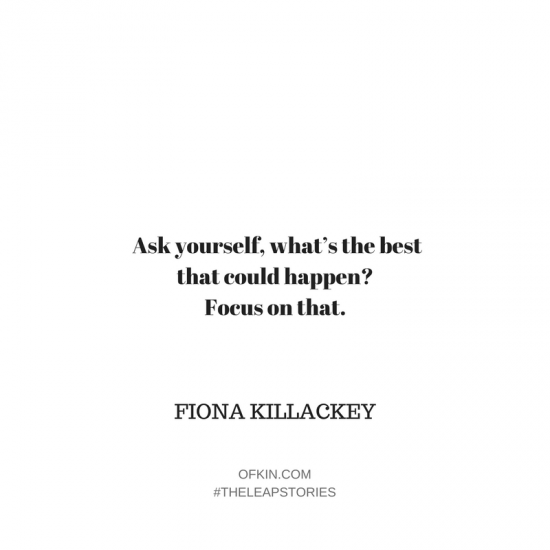 Ask yourself, what’s the best that could happen? Focus on that. Isn’t it worth taking the risk? We so often are driven by the fear of failing that we don’t allow ourselves the vision of what it could look like if it went right. I invite you this week to flip that scenario in whatever part of your life you’re feeling afraid about, and imagine your leaping life a year from now. Fiona is collaborating with a fellow leap taker Natasha Morgan to host a Marketing for Small Business Workshop in Daylesford on Sunday, April 15. You don’t want to miss Fiona’s marketing brilliance gained while working for Amazon, Audible and Mimco over 15 years, all delivered in autumnal Daylesford with a local produce lunch! Tickets here.